Welcome to TQ Unique Napkins! Be sure to view all the photos above for color choices, ordering information, delivery time and pricing. 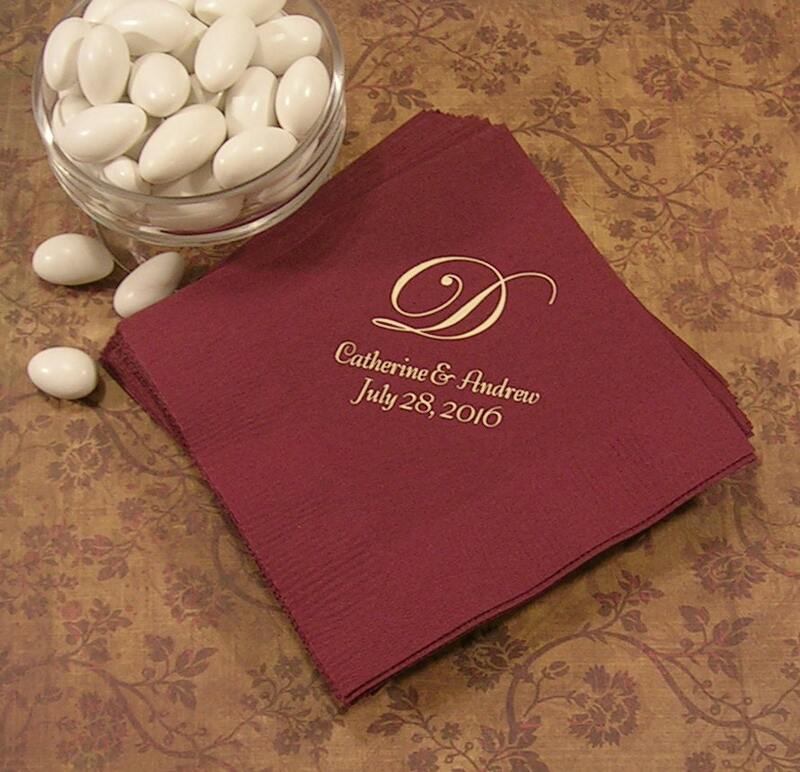 Your napkins will be printed with a single Monogram of your choice and up to 3 lines of your text. Can I get a proof? - For orders of 150+ napkins, I can send an electronic proof after purchase. Let me know when you check out if you require a proof. Can I get napkin samples? - Yes, I would be happy to send you free napkin samples in the mail. It is sometimes difficult to match event colors and encourage my customers to request samples before ordering. Can I have different napkin colors? - Yes, in sets of 50 napkins. Type this information in the "message to seller" when you purchase. Can I choose a different font? - Yes, when you make your purchase you can request my font choice list. How many napkins should I order? - 2 - 3 napkins per person for most events. Can you print my design? - No, I use metal dies to print the designs on my napkins. All supplies and machinery made in the US. Very beautiful napkins! Once they were shipped they arrived 2 days later! Everything I wanted was correct! I will be using TQUniqueNapkins again! The napkin was just as I wanted . They helped make our table. of my personalized items, your check would need to clear before I start producing your order. I hope you are happy with your purchase. If for some reason you are not, please send me a conversation with any issues you may have. There are no refunds on personalized items unless I have made a mistake on your order. I ship USPS first class and priority. You can expect your napkin order in your mailbox 10 days from your purchase date. This includes production and shipping time. Please "contact seller" before purchasing if you need napkins sooner, to confirm if delivery is possible before your event.